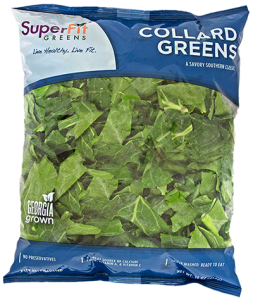 Great tasting, with loads of nutrition and very few calories, collards are the star of the southern leafy green family. Collard greens actually originated in the Mediterranean area, but have been known for many years as a traditional southern food in the U.S.
Collards are a member of the cabbage family and are packed with vitamin C, folate, manganese, and calcium! They are super nutritious and have been proven to help lower your cholesterol! 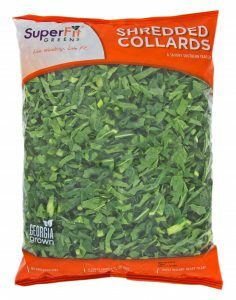 Whether you like them cooked until they juice or you enjoy them fresh and raw, collard greens are a versatile vegetable for your family’s dinner table. With a mild, smoky flavor, collards pair as well with poached eggs as with black-eyed peas and brown rice. All of this super power, and they are delicious too! • Proven to help lower cholesterol. Meatloaf, mashed sweet potatoes with sage butter. Regular 1 and 2 lbs.